It's my understanding that eUp companions on a separate reservation can only be added to the upgrade list within 24h via DCS. If R>0 within 24h, can the eUp companion directly access that R inventory or does it have to wait until check-in closes and upgrades get processed at the gate? I had an interesting chat with a concierge today. The order on their list (which I'm fairly confident mirrors the app) is not the same as the order things are processed in. This explains many situations I've observed where number 4 gets it but number 2 does not. Flying YYZ-YVR in paid J. Booked on 8pm, wanted to get on 7pm. Ticket allows for free SDC. J5 but flight oversold, so agent in lounge unable to do change. Wife and I placed on SBY. We did not show on the SBY list on the app, but only on the UG list where we fluctuated between 7/8 and 8/9. Cleared at T-40. I was surprised. On return was able to do SDC on app, but not at T-24, only on the actual day (obvious I guess) by checking in again. Worked very well, full list of all flights that day, stated no fee, took 30 secs to do and get new BPs. Encountered something new (to me) today and sought @canadiancow's opinion, who redirected me here for the wisdom of the crowd. This is for AC847 on 3/2. Booked in O a few weeks ago but it's been J9 P0 the entire time until a couple days ago when it became J5 (I suspect maybe bid upgrades clearing at the 3-day mark). As cow explained to me previously, BEL, A and HUN, W were likely ticketed in Y/B/O and confirmed their upgrades a long time ago when there was still positive P or R space. Note that 'booked' went from 35 to 36. Would that be a last minute J ticket sold or perhaps an LMU? Would and LMU show up as BEL, D and TRO, J do here? Or would those be unrelated events, with BEL, D and TRO, J being additional Y/B/O confirmed upgrades from long ago? 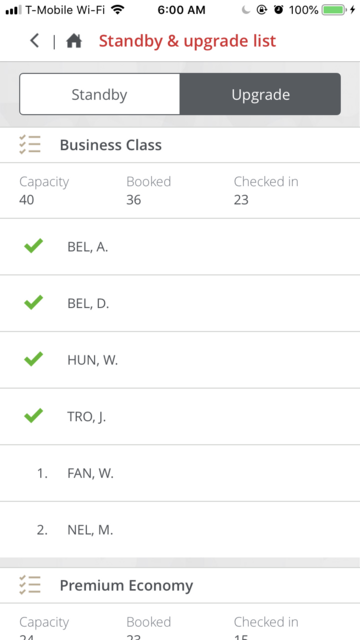 Any idea why I (FAN, W) would be confirmed well in advance of boarding? This has never happened to me before. Always either several days out or at the gate right as boarding commences. No complaints obviously. Just curious to understand how these things work. Any theories? The green check mark only shows up once people with a confirmed upgrade actually check in. The 2nd BEL pax was likely travelling with the first, but didn’t check in until later. When they did their name appeared in the portion of the list showing cleared pax. The change in the number of booked pax could be a few reasons. Last minute purchase, LMU, pax being rerouted for IROPS on another flight, etc. As to why you cleared 3hrs prior to the flight, it’s rare but has happened to me once before. Not sure why, just be glad you cleared and didn’t have to wait until last second. Thanks! This largely lines up with my hypotheses. I experienced this out of YYZ as the passenger who was #1 on the list well above 7/8. When I saw 7 jump me and get the only seat I queried the gate agent, she gave me the “there are many reasons why this could happen.” So I called BS and then I called the concierge. Concierge was great and advised that the passenger was paid J, like your situation, and standing by for an earlier flight. Why this has to put you on the public list is for whatever reason unfortunate to those who monitor the lists. If anything, just put them first. Flew SJC <> YVR this past weekend with a group of 6 under the same reservation. 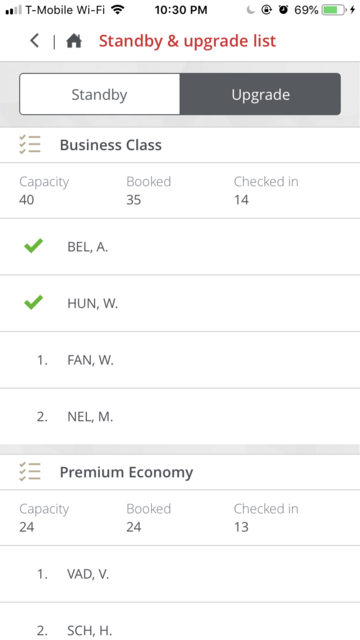 Only my girlfriend and I have status with star alliance gold, no one else in the group has any kind of status. Was in the lounge at SJC and right before boarding, they called my girlfriends and my name to the gate and exchanged our tickets for a business class ticket! Our group said economy was completely full and business class still had a couple seats left. I assume that AC would upgrade their own status first before going down SA status, so on the entire flight there were no more AC status passengers? On the way back from YVR -> SJC, they called for 1 volunteer to go on a next flight, and then called a group of 7 or so passengers including my girlfriend to go up to the gate. That group of 7 all got upgraded to business class, and the flight ended up being completely full in economy and business class. Was there anything I could have done to better my changes of being upgraded as well with my girlfriend? Maybe splitting up the reservation so we are both on the same reservation while the other 4 are by themselves? The gate agent also asked her if she was traveling by herself, she said no, but nothing change anyways. So here's an interesting one. I'm on standby for J. Seventh on the list in the app. When is standby processed? Is the list wrong, or is the concierge wrong? Others are paid J ? Priority from an earlier cancelled or missed flight? They're all confirmed on the flight in Y, requesting an upgrade. I'm on a later flight, on standby for this one. I've been told (by front-line and management) that standby is processed after upgrades (making the list correct, and also making J standby virtually impossible), but in the past year or so, my experience with J standby has had me clear into one seat, even when I'm way down the list. I'm not even sure today is a good example to test though, since 143 looks like it may be overbooked, in which case, no standby will clear. I think this mirrors what I posted up-thread when OH and I were showing 7/8 on UG list while SBY on paid J. I think we cleared 1 and 2. Definitely lots more on UG list than available seats (777 from YYZ-YVR in the evening, so you can guess the length of the list). J SBY seems to clear ahead of all UGs in my limited sample size. Also note I am 50K, OH no status, though same PNR. 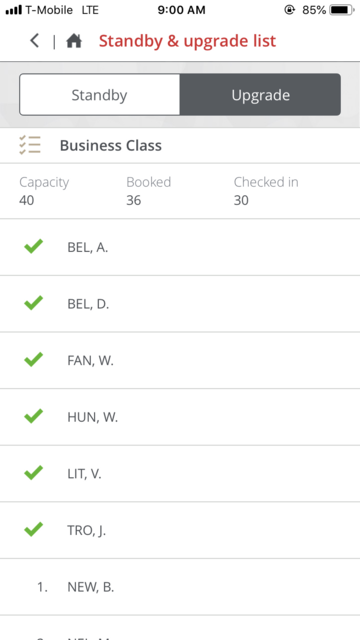 Not sure what’s happening on AC120 on Mar14, but they didn’t process the upgrade list in order as shown in the app. Agent was calling names way down in the list. Plane went from 16J to 40J, I was #5 according to the app, but I gave up when J was checked in full half way through boarding. Maybe due to all the cancellations and others with paid J seats? I’m confused. The upgrade list was as long as my arm but AC309 has empty pods as we leave the gate. Weird. I see the next flight, 311 has a delay posted of about an hour? Maybe a bunch of people in J from that flight put themselves on standby for the earlier flight but didn’t show, etc?